Last week I had the pleasure of attending a talk by the authors of the The Tudor Tailor (item CFP62556) at the Phoenix Museum of Art. Ninya (pronouced NIH-na) Mikhaila and Jane Malcolm-Davies kept the audience of costumers and reenactors stitched to our seats for two hours as they interpreted the lives of two women of the early 16th century through their relation to their garments and each other. Jane portrayed Ann Lauther, a woman of the gentlemanly class who lived in Yorkshire with her husband on a stipend of only £100 a year! With that she could maintain a fine house and 12 servants. Ninya portrayed Kat Myldmay, a woman of the village, who occasionally worked for Ann Lauther on contract. She would assist the house servants one day a month for a year with the linen washing for the grand sum of 4 pence a year! She also made extra money by mending clothes and assisting in other chores when needed. Between this money and other sums earned by her husband and children, the family lived comfortably on less than £1 a year. I was surprised to learn that a suit of clothing often cost as much as a Tudor person earned in a year. Jane explained that there were 12 shillings in a pound and 20 pence in a shilling. A yard of inexpensive wool to make a kirtle for Kat Myldmay was dear enough at 2 shillings and 8 pence and a kirtle took 3 yards of fabric. That cost more than a half year's wages for one garment. Kat could only afford one kirtle and had to wear it everyday! But she could dress it up with accessories. She also owned two aprons, two linen head scarves called "yard squares," a pair of detachable sleeves of green wool broadcloth, a partlet of black worsted wool, and a felted knit flat cap. She would only wear the nicer accessories on Sunday when she went to church. Ninya explained that the wool garments never were washed in water so they lasted a long time with care, so Kat Myldmay was very careful with her clothing. Everyone wore linen undergarments like smocks, shirts, and chemises to keep body oils and sweat from the outer garments. Kat owned three linen chemises—one to wear, one to wash, and one nice smock for Sunday. 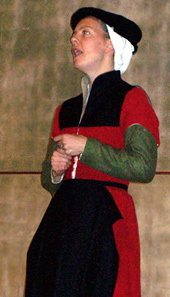 The kirtle and sleeves were lined with linen, too, which could be replaced when it became worn and soiled. This was called "freshing" the garments. 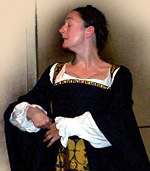 Jane's character, Ann, had to dress more elegantly as the mistress of a big household. Even so, she only owned one black silk gown which she wore to church and on special occasions. In the demonstrations Ann asked Kat to attend her while her own maids were not available. As Ann changed out of her everyday clothing and into her finery, the two authors lectured on clothing, economics, social customs, and English history, sometimes speaking as their characters and sometimes as narrators. Under Ann's loose robe and surcoat she was wearing her chemise and a light wool kirtle. The kirtle, which was also called a petticoat by Tudors, was a combination skirt and fitted bodice with narrow straps over the shoulders that was worn as a foundation garment. It laced in the front. The most amazing fact they discovered was that of all the kirtles mentioned in wills, inventories, and bills of sale, a full 89% were some shade of red. There was no boning in the kirtle, but the next two garments were boned. According to the authors, boned corsets, called "bodies," were not in evidence in the historical documents for their class until Elizabethan times. The next garment that Kat helped Ann Lauther into was her undergown of Damask silk. 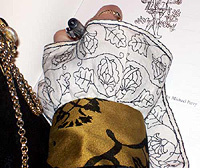 Only the hem, forepart, straps, and the front section of the bodice were of brocade—the rest was plain silk taffeta. This item of clothing was boned from waist to mid-chest all the way around. Because it laced in the back, it tended to flatten the bosoms, nearly pushing them under the arms. This created the typical Tudor sillhouette with a slight mounding above the decolletage, "Rather than," as Kat Myldmay would put it, "serving melons on a platter." The neckline of this gown was decorated with "fake pearls because Ann couldn't afford real ones." Even in Tudor times there was a vigorous industry in cheap costume jewelry. Then Kat assisted Ann into her black brocade silk outergown with wide sleeves that were turned back to the elbow. The gown was tightly laced over the midriff in the front. The authors pointed out that the eyelets for lacing were on separate strips of sturdy silk fabric that were boned and sewn on either side of the front. That way they could be easily replaced when they wore out from the strain of lacing. Both of the gowns were fully lined with linen or silk where the lining might show. The skirts were also innerlined from the waist to the knee with a fluffy wool fabric called "cotton." There was no cotton in it at all, but the innerlining resembled the fluffy plant fiber. This innerlining gave the skirts the proper bell-shaped drape without the use of hoopskirts or bumrolls. The last step was to cover the lacing in the front with a placard of matching black brocade silk. Kat Myldmay pinned the placard in place with handmade brass pins. 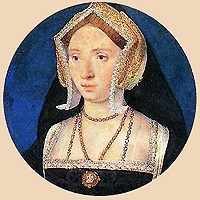 She said that the pins were the same as the ones that Queen Anne Boleyn used to pin her gown. Then she finished the process by pinning the shoulders to the undergown so that they wouldn't gap. After they were done with the dress, Ann put on a lovely French hood that was all of one piece, but she said that was only for convenience sake. 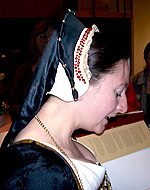 A Tudor woman would have worn a French hood that had many parts starting with a linen cap next to the hair and ending with a silk veil pinned to the crescent. Her other accessories included her blackworked cuffs, false sleeves, jewels, a pair of woolen hose, and sturdy leather strapover shoes. After the demonstration, the authors mingled with the audience at a reception and book signing. They graciously answered questions and invited us to touch and examine the clothing they were wearing. They also made other items available for close inspection, including a child's kirtle made of rough spun wool, a man's shirt of Holland linen, and a reference book of fabric swatches. Ninya and Jane have headed back to England after a whirlwind book tour of California and the Southwest. Hopefully they will return soon. The talk they gave in Phoenix was only one of six different presentations that they regularly perform. You can read more about them and view pictures from the book on their website, "The Tudor Tailor: Reconstructing 16th Century Dress." The other talks cover men's clothing, the upper classes, and full Elizabethan court wear. There is also a Yahoo Group that you can join, to discuss the book. 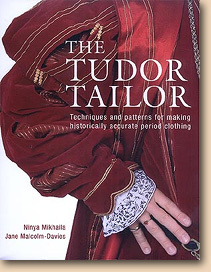 The book The Tudor Tailor includes clothing and accessories for all classes, with fascinating background on the lives of these people, many color and black and white photographs, historical examples from paintings, statues, and extant garments, and detailed patterns for all the garments. The 160-page book is available from Chivalry Sports Renaissance Store for $34.95. If you want to add this article to your list of favorites or email it to a friend, please use this permanent URL, https://stores.renstore.com/-strse-template/0705A/Page.bok. Permission is granted by the author to quote from this page or use it in handouts as long as you include a link back to Renstore.com.